Go one on one, face off as a team or participate from the audience. 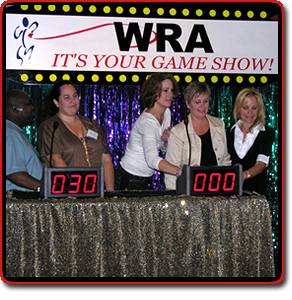 Our popular Game Show productions are a great way to get people working and laughing together. Teams are created on site, or in advance, and can show their team spirit with matching leis, bandannas or create their own team t-shirts. The Emcee will keep the action moving with a variety of trivia questions designed to be fun and entertaining from historical to current pop culture. Questions teams can’t answer are opened up to the crowd to keep everyone involved. Contestants and audience members win raffle tickets for correct answers. 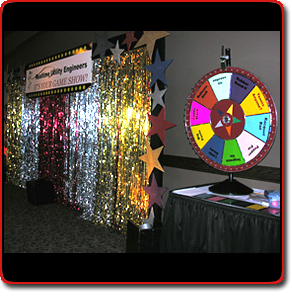 The package includes light up podiums, sound system, and a customized client sign on a colorful backdrop. 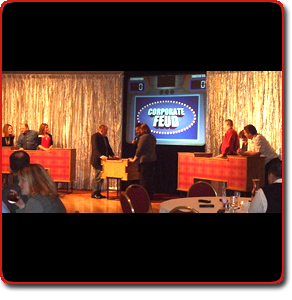 Add interaction and fun to your next corporate party, picnic, birthday or Bar/Bat Mitzvah. Company or personal trivia can be included to customize the show. Our standard game show with a twist- The Challenge Wheel of Fortune! The Challenge Wheel of Fortune adds even more interaction to our standard game show. Along with fun trivia questions, contestants spin the Big Wheel and then perform the challenge it lands on. A definite crowd pleaser.